Yes, zero emissions. 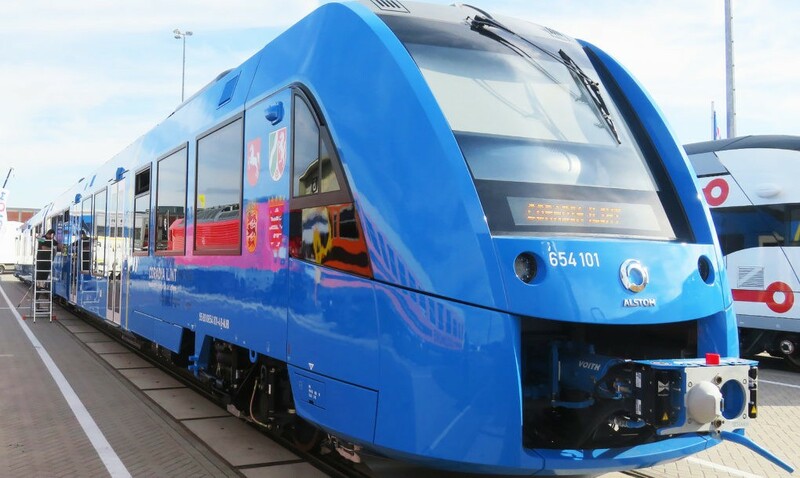 This is a new train just finished in Germany. It’s a hydrogen train, or “hydrail,” and is the first passenger train powered completely by hydrogen. The company that built it is called Alstom, and they’re French. “Coradia iLint is a new CO2-emission-free regional train and alternative to diesel power. It is powered by a hydrogen fuel cell, its only emission being steam and condensed water while operating with a low level of noise,” according to the company. The zero emissions hydrogen train will be put into service on Germany’s Buxtehude-Bremervörde-Bremerhaven-Cuxhaven line in Lower Saxony by December 2017. Top speed: 87 miles per hour (140 km/h). It will also be much quieter than diesel trains. Passengers will only be able to hear the rush of wind and the sound of the wheels in motion.